It's the dead of winter here in Indiana, and if you have children they might be getting a little restless. Why not make plans for a family road trip to visit some indoor waterparks? Not only will the kids get some energy out, hopefully the parents can enjoy a few days away as well. 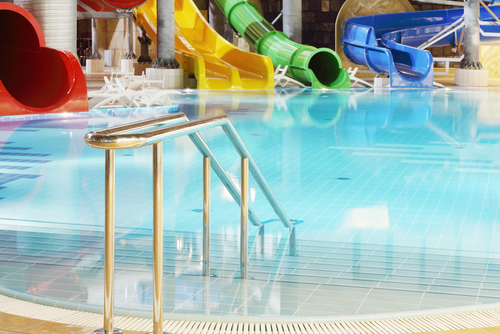 Check out these indoor waterparks within driving distance that are fun for the whole family! Located in French Lick, Indiana, this 40,000 square foot indoor waterpark is enclosed with a glass structure that protects you from the elements while still letting light in. (When it's nice outside, the roof of the water park can be retracted to open the park to the outdoors.) Sporting a pirate theme, you'll find water attractions like the gentle flowing Lost River that you can float on, Buccaneer Bay a three-story water play structure topped with a tipping water bucket, and single and double tube rides and two speedy body slides. For adults, there is a reserved area called Palm Cove to get away from the kids and for young children. Right here in Indianapolis is Caribbean Cove, an indoor waterpark that's part of the 344-room Holiday Inn North at the Pyramids. The 50,000 square foot indoor waterpark features three waterslides, a plunge pool, a sports activity pool with basketball, a lazy river and a water structure with 700-gallon dumping bucket. Caribbean Cove also has an arcade with video and redemption games. Great Wolf Lodge is located about 2.5 hours east of Indianapolis in Cincinnati, Ohio. Your Great Wolf Lodge adventure begins in our massive, 84-degree indoor water park. Splash the day away in over 79,000 square feet of water-packed excitement, including jaw-dropping slides for thrill seekers or zero-depth entry areas for little ones. Grab a wand and battle a dragon in MagiQuest or get an ice cream-themed manicure in Scoops Kid Spa before gathering your family in the Grand Lobby for nightly Story Time, the perfect ending to a Great Wolf day. Wherever you go, just dive in! It will be fun for the entire family this winter!